Saute first 4 ingredients for 5 minutes. 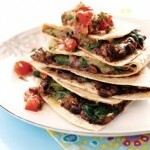 Place mixture on tortillas; sprinkle with cheese. Fold in half and cook in pan until cheese melts and tortilla is toasted.